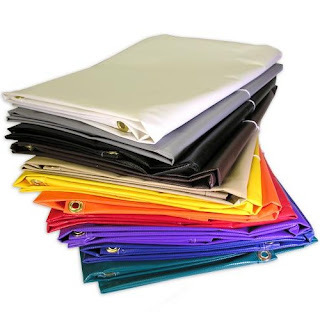 The advantage of a vinyl tarp over other types may not be immediately known, but it is important to match the type to the purpose. For example, if you are wanting to protect your wood pile from the heavy rains that are due, you probably would not want to choose a mesh type for the job. This type of tarp is superior over mesh in the fact that it is specifically designed to keep moisture out, while the mesh type is breathable and may allow for excessive moisture to pass through. This type of material is not likely to be used for filtered shade on your patio, but more likely to be used to cover the boxes in the garage or provide extra waterproofing for your tent on your next camping trip. Protection is not the only use for this type of vinyl tarpaulin. Often used for advertising banners and merchandising tents, it has proven to be quite durable, light weight, and easily transportable. So its ease of use makes it preferential to more permanent solid construction booth rentals that may be lest cost effective. With the vinyl tarps ease of use, many different people and industries can make use of the benefits of it. The average home user can use vinyl tarps to protect their belongings, while events can vend goods, provide shelter, and even advertising using all the same material. How you use it is entirely up to you. Some people have even been creative enough to use it as a backdrop for a projection screen, and some have made a slippery slide. It certainly has been used creatively by a wide variety of people. The advantage of a vinyl tarp is that it is a strong, durable, and cost effective material that can provide shelter from the elements as well as advertise your goods. A little vinyl tarpaulin and imagination can go a long way. Best place for vinyl tarps! Hands down.